A visually striking and hardy, evergreen/semi-evergreen, medium to large shrub with graceful arching branches. The new foliage is golden in colour, ageing to a medium to dark green with buttery yellow margins. Small tubular flowers in Summer and are an attractant to butterflies. 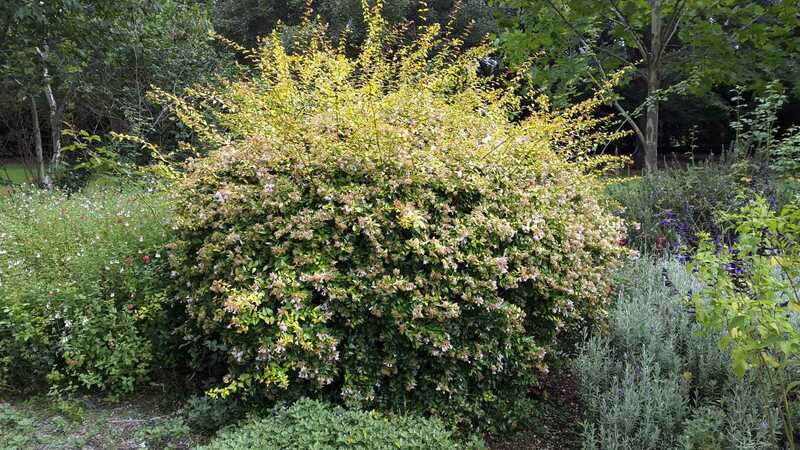 The thicket like habit means that the plant is able to be clipped into a hedge to give excellent contrast to neighbouring green shrubs, or grown as specimen plantings. Performs best in well drained soils but is tolerant of soils ranging from sandy to clayey with minimal to regular watering required, depending upon conditions. Dislikes wet feet. Tolerates light frosts. Prune in spring to remove old wood. No specific pests or diseases.